In May this year, 2004, the Reading Coin Club celebrates its 40th Anniversary. This is a remarkable achievement considering that most of the numismatic societies born during the collecting boom of the late 1960's are long gone. Hence it is appropriate to provide a short reflection of our first 40 years. 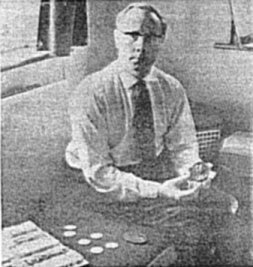 The founding father of the club was Michael Broome, who having met with a few other local coin collectors, wrote to a Reading newspaper seeking support for the formation of a coin club. The letter was published and Michael received four replies. He also had strong support from the then director of Reading Museum, Mr T Gwatkin who was seeking assistance with collating and updating the museums coin collection. And so it was that an inaugural meeting took place at Michaels house at 8pm on the 6th May 1964. The turnout was better than expected, for in fact nine people attended. In reading the archive material it becomes immediately apparent that those founding figures did a great job in setting up the club. The organisation they established within the first few weeks has certainly stood the test of time, for it has remained virtually unchanged for 40 years. The draft constitution and rules of the club were established within a month, in time for the first AGM on the 15th June. Other than the reports from the officers that were yet to be elected, the agenda for the meeting was not much different to that which we follow today. At the first meeting the offices of the club were established, namely Chair, Treasurer, Secretary and two Committee members without portfolio. For any club it is desirable to have a_badge. Fittingly, Michael Broome chose an escallop for the Reading Coin Club emblem, as it was the mintmark of coins minted in Reading during the reign of Edward III, 1327 -1377. The escallop is taken from the heraldic arms of Reading Abbey founded in 1125. The patron saint of the Abbey, St James, is often depicted carrying a scallop shell, the sign of a pilgrim. The words `Reading Coin Club' around the club emblem are spelt in Florentine lettering from the period circa 1350. From the very beginning the Reading club has been well supported. Within one year of starting the membership stood at 42, including such notables as P J Seaby. Over most of the 40 years the membership has been typically between 40 -47 members, peaking at 70+ in the mid 1970's. However, in more recent times there has been a steady fall to the low 30's, principally due to a declining interest in the hobby, the restrictions imposed by advancing age and the demise of long standing members such as M Broome, M Myhill, M Lucket, K Hosmer and K Cooper to name but a few. However, the good news is that while membership is low compared to the past, numbers are once again slowly rising to the current total of 38. The other good news is that meetings are well supported. Several recent speakers have commented favourably on the high turnout at club meetings where we regularly achieve an attendance of 23+. In looking back through the records, as one would expect, very few of the early members are still attending. Of the current members John is the earliest name in the records, having joined in January 1965. However, as John had some time away from the club the honour of the being longest continuous member goes to Bryan who joined in April 1967. Other long standing current members include David (1969), Frank (1970) and Graham (1972). A key factor that has contributed to the success of the club has been the time and effort put in by the elected officers. Many members both past and present have taken on the elected roles to both manage the club affairs and arrange the numerous activities, including the guest speaker programme. Rather than attempting to provide a detailed narrative, a history of who has held which post is presented in the attached summary. From this it is apparent that several current members have held positions for more than ten years ( John, Tim, Bryan, David). However, the distinction of being the longest serving officer goes to Frank who has completed 15 years in several different posts. In recent times Frank has used his good connections to organise some excellent guest speaker programmes. In April 1968 a proposal for the posts of President and Vice president was discussed, and a draft prepared for discussion at the AGM. This proposal must have been successful since Michael Broome became the first president in 1968, followed a year later by Marcus as the first Vice President. These offices tend to be filled by retiring committee officers. However, at least twice in the past the membership has queried this tradition on the basis that they feel excluded from the nomination process. With regard to the activities of the officers a review of the records indicates that since the clubs inception there has been virtually no change in either the running of the club or the format of the committee meetings. One minor variation of note is that in the early days the activities associated with 'Publicity', 'Guest Speakers' and the `Library' were shared amongst the various officers. Today these functions tend to taken on by the committee members without portfolio. In the early days the club seemed to have a greater external focus and the committee discussed numerous ideas for taking the club forward. Indeed the club had designated leaders of sub groups for the main branches of numismatics ear, Milled Silver, Copper, Ancients, Foreign etc. However, as is often the case a lack of support resulted in the cessation of the sub groups. Having set the club up the next concern was where to meet. Initially meetings were held on rotation in member's homes. However, with the membership rising rapidly this became impractical, and so it was that an arrangement was made Reading Museum, no doubt facilitated by the then Director Mr T Gwatkin who had strong links with the club. The first meeting took place in January 1965 and this continued to be the venue for the next 14 years, until refurbishment of the Museum prompted a move to the Abbey Gateway. Whilst somewhat cosy this Victorian replica of a bygone age will probably be remembered more for its very steep stairs, considerable gloom and welcoming chill rather than a centre of numismatic learning. Thus it was that in 1998 the club was on the move again to a very nice room in the Reading Library. However, concerns over security and caretaker costs meant our stay was very short. Fortunately in 2000 we were able to secure our current venue at the Abbey Baptist church. The club has always had some form of newsletter. In the early days the letter was principally a calling notice and information sheet listing the upcoming club activities. Later very brief summaries of meetings began to appear. Then over a period of years these developed into more extensive summaries, along with short articles of numismatic interest. While on the topic of short articles. In 1972 the club launched its own magazine entitled "The Escallop". This was at first published quarterly and then latterly annually. The magazine contained articles contributed by members and summaries of guest speaker talks, covering a wide range of topics such as Thalers in Asia. Replacement banknotes, Mintmarks. Reading tokens, Arabic coins plus articles on tokens, medals and hammered coins. Clearly a lot of effort went into producing this publication. It was probably the required effort and a dearth of contributory material that accounted for its early demise in 1975. Over the entire existence of the club the activities have tended to follow a format established in the early years, principally a mixture of guest speakers, short talks by members, socials and external events. The principal corner stone for club meetings has been the guest speaker programme. It is impossible in a short narrative such as this to provide the details of all the talks, but as the attached summary shows just about all the prominent numismatists have spoken to members at some time or other. The subject matter presented has covered the whole spectrum of coins, medals, tokens, passes tickets etc, from ancients to modern, from home and abroad. We have had talks on engravers, the use of money, famous hoards, counting boards and historical events - the list is almost endless. It is a credit to the club that we have managed to arrange 5 or more guest speakers in every year for the past 37 years. A special round of thanks is due to all the programme secretaries, but especially Frank who with his contacts has put together some noteworthy programmes. Right from the very beginning short talks by members has been a key feature the annual programme. The strength of knowledge amongst the membership has made this possible. It is quite remarkable that each year we are still able to provide 4 or 5 quality talks on all sorts of topics. In recognition of the importance of this prominent activity it was decided to commemorate Mark Myhill's outstanding contribution to the club by creating a memorial shield, awarded annually for the best short talk. The first award was in 2000. The archives make fascinating reading to find out who has spoken on what topics. While the details in the past records appear incomplete the attached summary gives some idea of the speakers and topics. Lets hope in the future we can look forward to other members taking to the floor for ten minutes. Other activities at meetings have included coin fairs, buy and sell opportunities, quizzes of all types which are often good fun, identification competitions and of course the annual auction. Visits to and from other coin clubs (Southampton, Maidenhead, Slough, Woking) was a feature of the early days as were coin swop evenings, the latter being a feature when all things commercial did not feature so high in the social makeup. Another long-standing event is the annual display competition, the winner being awarded the Michael Broome memorial trophy. Here again the range of displays entered over the years is remarkable, both in their good quality and wide ranging subject matter. The details in the club records of the entries for the earlier years are somewhat sparse, which therefore precludes a detailed report. However, yet another summary of winners gives a flavour of the displays presented and who are making the effort to provide an entry. Social events have been a feature of the club for a long time. In the beginning social evenings with partners, including wine and cheese gatherings and buffets were a held on a regular basis. There was also a formal annual dinner with guest speakers. As time progressed the formal dinner became a more relaxed affair apparently disappearing completely in the 1980's. However, the lack of an annual social event did not last long for in the late 80's the summer social was instigated in the form of a garden party. Hosts for this event have included Tim, Michael and Alan. However, it was Mark Myhill whose name is synonymous with the garden party, having been the host on 5 occasions. Today the garden party is no more, having been replaced with visits to places of numismatic interest. So far we have visited the British Museum, the Royal Mint, the Ashmolean, the Birmingham Art Gallery, the Boulton Museum and the Bank of England. This year we are planning a return to the Royal mint - who wants to see a 1933 1d and a set of Edward VIII coins? The other long-standing social event is the Spring Social. This is usually a skittles evening, which being first mooted in 1978, has stood the test of time. Various forms of competition are devised which apart from being really good fun, certainly levels out the experience factor, ie novices often win. In the earlv years the club had a close association with Reading Museum and when required provided assistance and displays for their special events. In fact members were encouraged to review the museums coin collection and advise the Director of possible future purchases to fill identified gaps. The club records do mention the possibility of Reading club contributing to the purchase of a British gold stator. An older member does recall the club actually making a significant donation. 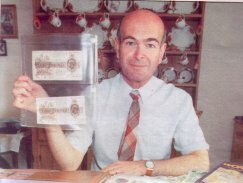 In 1964 the club became a member of BANS (British Association of Numismatic Societies). It was only some five years later in 1969 that the club organised the BANS Congress held in Reading. Over 130 delegates attended the event, which by all accounts was a great success. The organisers received well deserved praise, which was particularly gratifying for a club then only 5 years old. In the same year the club provided a display for `Boots the Chemists'. To mark the l0th anniversary of the club, members provided a series of exhibits that were displayed at the Guildhall in Wallingford. On show were Anglo Saxon & Norman coins minted at Wallingford, Berkshire medals & tokens and a collection of civic plate. A year later the club provided displays at the Reading Museum and the Library. The club's 25th anniversary occurred in 1989 and the special May meeting, hosted by the Mayor of Reading, included a civic reception. The Mayor and the acting chairman made speeches, which were followed by an excellent talk from the guest speaker, Peter Clayton. The 80+ guests, including many notables from numismatic circles, were then invited to view the small display in the Mayors parlour and enjoy the finger buffet and drinks. Two larger displays were mounted in the Art Gallery, one containing items of local numismatic interest and the other showing the link between the coin club, numismatics and local history. Clearly the committee of the time (Michael B, Frank M, Mark M & David P) put in a lot of hard work to ensure the success of the evening. A follow up enquiry on the display came from a bemused member looking for the escallop mintmark on the Reading penny. Unfortunately the example on show did not have the shell. This was because the display coin was not a true Reading penny. It was minted in London with an annulet on the king's breast denoting the proceeds of the coining being assigned to the Abbot of Reading. In October 2000 the club participated in the British Museum Open Day. The club put on show various numismatic displays, which were well received. However, the star attraction for the young visitors was a shoebox full of assorted coins, which they could handle. This generated considerable interest and numerous questions that kept the club volunteers very busy all day. It just goes to show that it is not always the expensive fancy displays that hit the mark. Compiling these notes has entailed much reading of the club archives. While much is dry there are some interesting bits and pieces. However, the principal observation is how well the tenor of the records are in tune with the state of coin collecting over the time in question. In the 60's & 70's almost everything about the club is upbeat and new ideas abound. Then in the 80's and early 90's things settle down to the tried and tested activities, with the occasional bright spark and several elements of gloom (falling membership, low attendance and restrained enthusiasm). Then from the mid 90's onwards there is a more outward and optimistic view with once again more enthusiasm and support for the club activities. Doesn't that also describe the past 40 years of the commercial numismatic market?